I don’t often get to grow my own vegetables living in an apartment in the middle of New York City. Sometimes I long for an outdoor garden where I can grow fresh herbs and vegetables a la Barefoot Contessa. 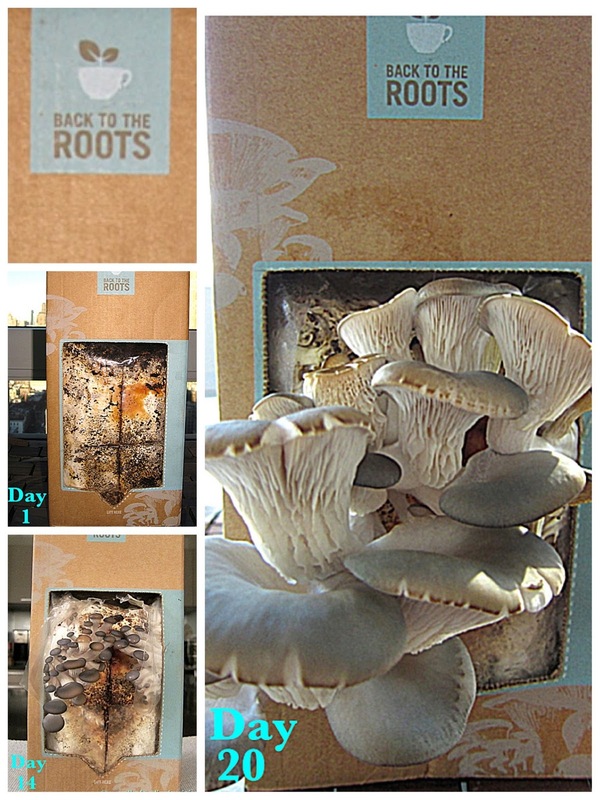 So when I heard about the Back to the Roots Grow-Your-Own Mushroom Garden Kit, I leapt at the chance to cultivate my own crop and ordered one online. Founded by two former UC Berkley students, this kit turns “waste into wages & fresh local food” by growing gourmet mushrooms entirely from recycled coffee grounds. I have to say that after watering it twice a day for almost two weeks without any signs of life, I had almost completely given up. And then one morning I woke up and saw adorable little mushrooms sprouting from the cardboard box. I actually let out a yelp of delight that made my husband come running into the room to see if I was alright! Over the next few days, they grew even more until I had a full crop of beautiful oyster mushrooms. I wanted to make a dish that would do justice to these lovely mushrooms. I immediately thought of making a risotto, one of my favorite Italian dishes, but I wanted to make a more nutritious version using a whole grain. Risotto is a rice dish that is usually served as a primo, or first course, before the main course. Classic risotto is prepared with a specific type of white rice. My version, however, is made with barley (a whole grain) and cooked in the style of risotto, which means that liquid is added to the grain in increments and stirred often. This cooking technique allows the starches in the grain to release slowly and gives the dish a creamy texture. Barley comes in a few different varieties including hulled, pot/Scotch and pearl barley. 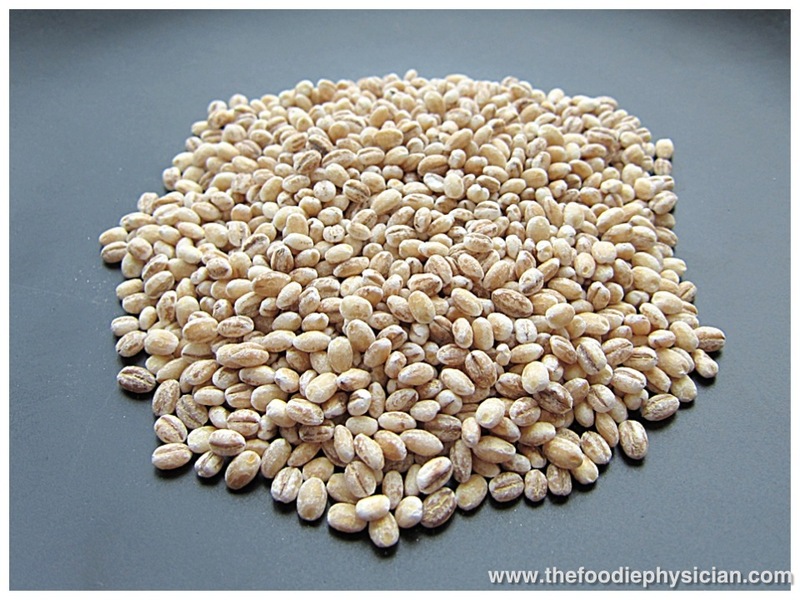 My recipe uses pearl barley- a type of barley that is hulled (the inedible outer layer is removed) and polished. Classic risotto is made with short- or medium-grain rice with a high starch content because these varieties give the creamiest texture. The main types used in Italian cooking are Arborio, Carnaroli, and Vialone Nano (with the latter two considered to be the superior varieties). Because barley risotto is not naturally going to be as creamy as traditional risotto, I like to add a little something at the end to up the creaminess factor. Traditional risottos are finished with grated cheese and butter or sometimes mascarpone cheese. My version uses grated Pecorino Romano cheese and a small amount of reduced fat cream cheese, which not only adds creaminess but a nice flavor as well. Barley has a chewier texture than traditional risotto rice which may throw people off the first time they try it. However, I like the toothsome bite and find it to be hearty and comforting, especially in the winter months. It also has a nice nutty flavor that works well with the earthiness of the mushrooms and thyme in this dish. I also stir in some baby spinach at the end for an extra boost of nutrients and color. This dish takes a little time and patience to make because barley takes longer to cook than traditional risotto rice. If you don’t have the time to stand over the stove stirring the whole time, you can add the liquid in larger increments. And finally, if you’re a purist and prefer to make a traditional Italian risotto with Arborio, Carnaroli or Vialone Nano rice, you can use the same technique that’s described in this recipe, just be sure to adjust for a shorter cooking time. Buon appetito! Heat the stock and 4 cups water together in a medium saucepan over medium heat. Meanwhile, heat 2 teaspoons oil in a large sauté pan over medium heat. Add the onion and cook until translucent. Add the garlic, 2 teaspoons thyme, bay leaf, 1 teaspoon salt and ¼ teaspoon pepper and cook another minute until fragrant. Add the barley and stir to coat all of the grains with the oil. Add the wine and cook 2-3 minutes until it is absorbed. Add the stock to the barley in increments of about 1½ cups, stirring often to prevent the grains from catching bottom. Adjust the heat to keep the mixture at a low simmer. After each addition of liquid, let the barley absorb most of the liquid before adding more. The process should take about 40 minutes and at the end, the barley should be tender but with a chewy texture. While the barley is cooking, heat the remaining 2 teaspoons oil in a sauté pan over medium high heat. Add the mushrooms and sauté until nicely browned, 3-4 minutes. Season the mushrooms with salt and pepper. Set aside. When the barley is cooked, lower the heat and stir in the mushrooms, spinach, pecorino, Neufchâtel cheese and remaining teaspoon of thyme. Season the mixture with salt and pepper to taste. Garnish with an extra sprinkle of pecorino if desired. Serve immediately. Thanks, bambiman! If you try it, let me know how it turns out! Great sounding risotto recipe, thanks for a new one to try for the family. Thanks for your comment! Please let me know how it goes if you try the recipe! That sounds wonderful–I have never tried barley for risotto but I am a barley fan. Sounds delish!! Not sure I have the patience to grow mushrooms but that kit sounds great! Looking for new things to try out on my vegetarian husband and kids – this looks like a gray idea! Always intimidated by risotto this looks doable thank u! I used to be intimidated by risotto too! But it's not hard, it just takes a little time- and it's so worth it! Mine too- I always order risotto when I see it on a restaurant menu! Yes, you can substitute any kind of mushroom you have. Enjoy! That looks amazing Sonali!! 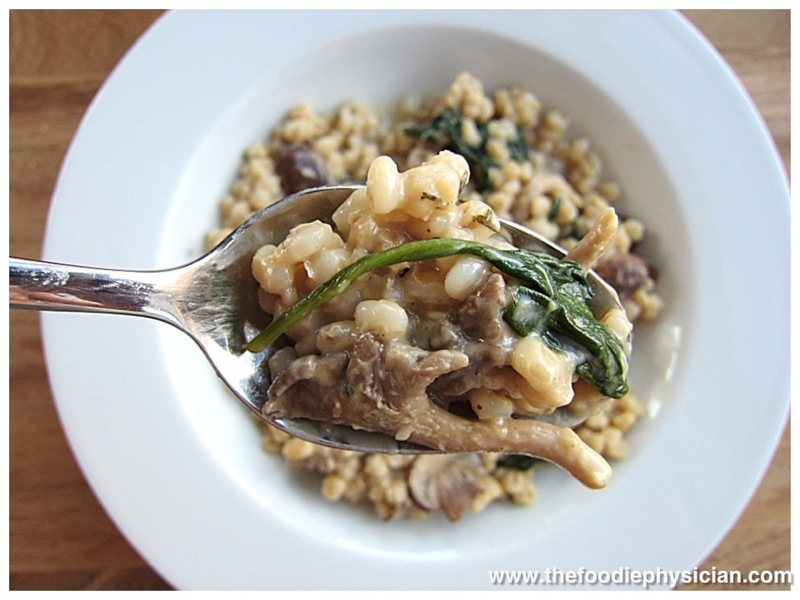 I have a mushroom risotto dish in my repertoire, I must try this barley version. Yum! Amazing looking risotto. How much better that you grew your own mushrooms. Thank you for stopping by. Your site is great- next time I will try one of your kits! This looks fantastic! So happy I found your site from Healthy Aperture 🙂 Just started following, can't wait to see more! Thanks for stopping by Kaitlin! I just recently discovered Healthy Aperture- it's such a great site! I will try this for sure. 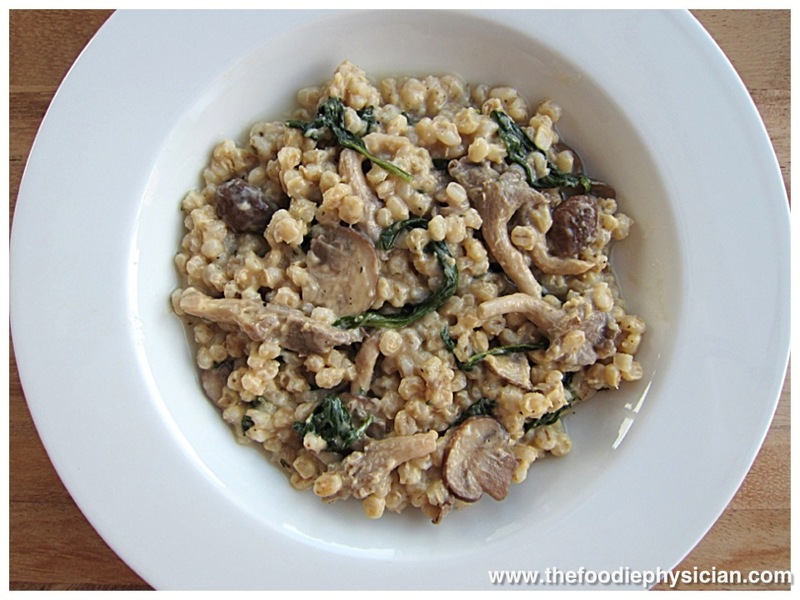 I have a similar recipe for mushroom barley 'casserole'. I had to tell you…. so so delicious. I just made your barley risotto with my shrooms from my "back to the roots box.' I was so hungry I didn't have the patience to photograph it. I will next time. I just wanted to thank you for engaging with me.